Ahoy! The second annual Thirsty Games competition was a smash this year. Thirsty Games finalists Affinity, Burning Soul, and Little Earth Project poured beers side by side on The Thirsty Games bar throughout IMBC 17. 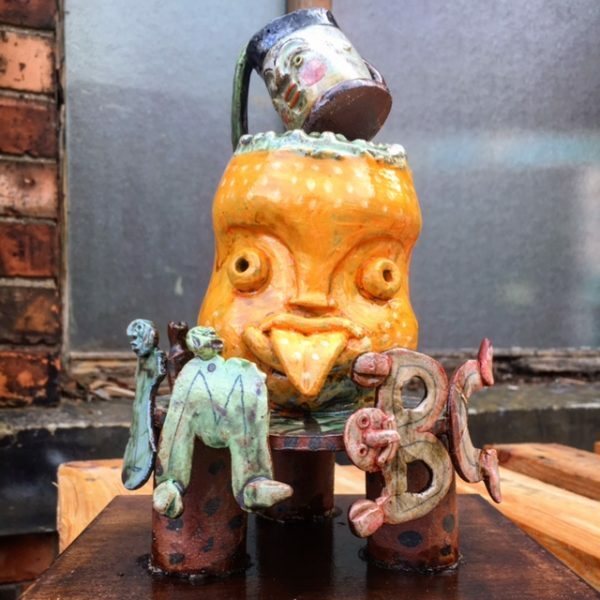 Burning Soul lifted the Thirsty Games trophy (made by Manchester artist Pascal Nichols) on Sunday evening after winning the public vote. We caught up with Burning Soul to congratulate them on their victory and to see what they’re up to now. Firstly, congratulations on winning The Thirsty Games! How was your experience at IMBC 17? Cheers man, yeah we had an absolute blast. Everyone has always told us how awesome Indy Man is, we always planned to go but always tried getting tickets too late. To go for the first time taking our beer along was epic and it did not disappoint! From the general vibe, to everyone is there to have a great time, the setting is such a great building, to the ridiculously high standard of beer made us feel very honoured to be pouring there. You lifted the Thirsty Games trophy at 5pm on Sunday – was there an immediate reaction once news spread? It was a great moment with people at Indy Man who we’d met over the weekend and the social media went a bit crazy with people congratulating us, we were buzzing. You guys brought three of your beers along – can you talk us through them? Was there a standout beer that punters reacted especially favourably towards? Belgian IPA which is a personal favourite of ours. It’s brewed with Summit, Chinook and Citra then fermented cool with a Belgian yeast. It just works really well with the citrus hops giving it a real depth of flavour. Citra Amarillo Sour which is a new one we have been trying lately from our pilot kit and it finished fermenting just in time and was tasting great so we brought it along to see what people thought. It’s clean smooth sour with a hit of citrus from the dry hop. Really happy with how it went down at the fest and we have just started brewing up a batch on our full kit yesterday excited to see how it comes out. And last but not least a lightly Barrel Aged Coconut Porter, this was the most stand out beer people were really enjoying, including Logan Plant who came over to check out the Thirsty Games. This is the first beer we have put in a barrel but it’s definitely not the last. Its only been in the barrel for 1 month. We were originally going to bring our normal version but after having a taste we knew we had to sneak a little out early just for Indy man and were glad we did. It’s a dark rich chocolatey porter enhanced with toasted coconut then the Jack Daniels Barrel added lush smooth vanilla notes. How did you find feedback in general? 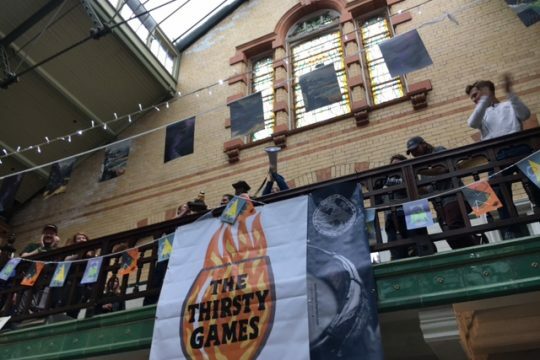 Did it seem like there was a lot of interaction from festival goers with the Thirsty Games bar? 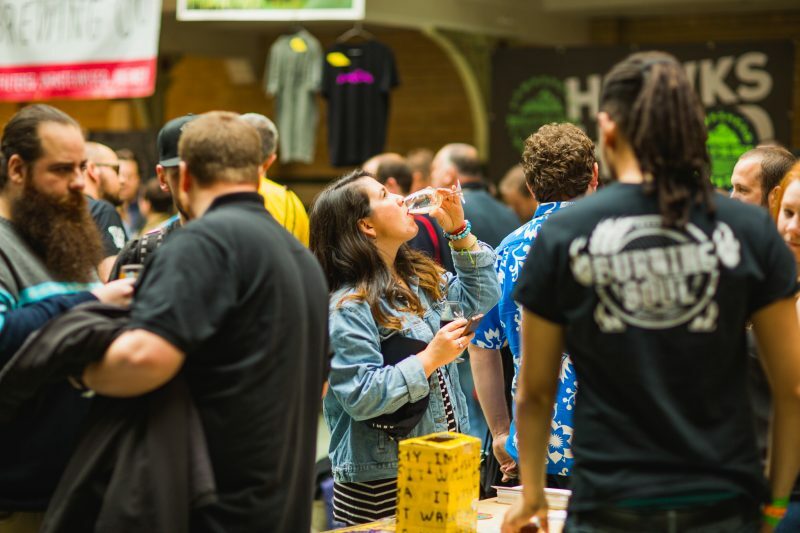 Yeah the interaction was great, lots of people would come up intrigued so we would tell them what its all about get them to taste all the beers and buy their favourite. These guys are the reason we had such a great time. We couldn’t have asked to spend 4 days with a more lovelier bunch of people and their beers were great. Even though we were technically in competition it never felt like it. We were just a group of people, who love beer, hanging out at Indy man, having a great time. All of us singing along to queen at the end of Friday is one great memory in particular. 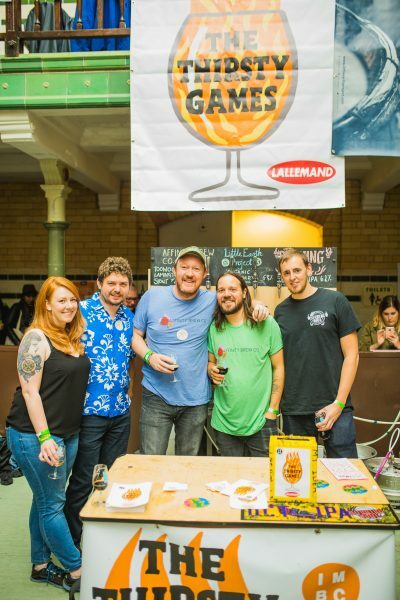 What were you beer highlights from IMBC 17? It has to be getting to meet Logan and getting to talk beer with him. He was telling us about when he started out and how he went about things. He was really digging the coconut porter and was generally interested asking about the process for getting the coconut flavour into the beer. We got his vote which made our day. What kind of kit are you working with at your brewery? We have a 4bbl brew house that’s completely self built (after a lot of auction hunting, some quick lessons in metal work and ordering a lot of piece’s of stainless steel off the internet). 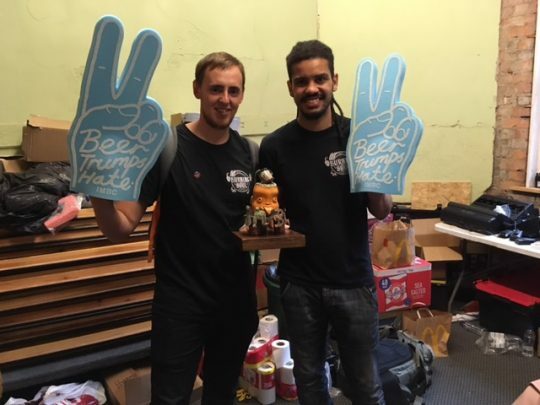 When we got the keys to our premises it was particularly terrifying as we suddenly had overheads and nothing but a pile of parts and tanks (that was a long way from being able to brew beer) After 3 months hard work it actually worked which was the biggest sigh of relief. We have since had some upgrades in the form of 2 new shiny conditioning tanks. We also often have our 100l pilot kit running, testing out new recipes that we put on in our taproom to see what our customers make of them. If anyone is on a Burning Soul pilgrimage, where should visitors to Birmingham head? Our brewery tap is located by the Jewellery Quarter area of Birmingham City Centre, we’re based at 51 Mott St B19 3HE. You can actually get a tram from New Street Station to St. Paul’s for £1 which is 3 mins round the corner from us. We’re open Fridays 4-8 and Saturdays 1-8. We have 8 rotating taps plus take out bottles. We sell our beer to many local pubs and bars including the Wolf, 1000 Trades, Wellington, Post Office Vaults, Clink, Cotteridge Wines, Wildcat Tap, Cherry Reds. What’s next for Burning Soul? We just want to keep perfecting our beers. Now that we’re starting to really understand our kit and how to get the best out of it, we can start scaling up a lot more of our small batch recipes and getting them outside of our taproom. We’re all about experimenting, that’s what makes brewing exciting so we hope to have a lot of new beers out in the next year. Where can people pick your beers up? At the moment mostly in bars in and around Birmingham. We have just started selling on Eebria trade so we should start getting kegs further afield . We have done some bottle runs which can be found in local bottle shops such as Cotteridge Wines, Connellys Wines and Clink (although limited stock at the moment). We were chatting to the canning guys We Can at Indy Man so this is an option we’d definitely like to explore so watch this space! Thirsty Games 2017 winners BURNING SOUL!